This guide explains how to pay a Penalty Charge Notice and Fixed Penalty Notice fines. Further information shows how to challenge a PCN at a local authority or the police. PARKING TICKET LAWS: There are several different types of parking tickets. The correct method for paying parking fines depends on who issues them. County council authorities issue most parking tickets. The police, Transport for London (TfL), and some private companies can also issue fines for illegal parking. The most common type of parking fine is the Penalty Charge Notice (PCN). It is usually handed out by your local council or Transport for London. Local councils can also penalise illegal parking by issuing an Excess Charge Notice (ECN) or a Standard Charge Notice (SCN). The police might give you a Fixed Penalty Notice (FPN). Whereas a parking ticket from private company is like a Council Penalty Charge Notice. As a rule you they give you 28 days to pay up or challenge the parking ticket. Note: Parking ticket rules differ in Northern Ireland and Scotland. You can contact Citizens Advice for further information. As a rule, you do not get driving licence penalty point endorsements for getting a parking ticket. But, an exception could be on some Fixed Penalty Notices issued by the police. Break certain traffic rules. Typical examples include driving in a designated bus lane or going against 'no right turn' traffic signs. Avoid paying the charge for the London congestion zone, the low emission zone, or the Dartford Crossing on time (Dart Charge). PCN issued by a local council. PCN issued for Dartford Crossing (Dart Charge). Red route PCN handed out by Transport for London (TfL). Low Emission Zone (LEZ) PCN issued by TfL. Congestion Charge PCN issued by TfL. Payment fees for a Penalty Charge Notice parking ticket increases the longer it does not get paid. Paying the fine within 14 days often gets a charge reduction of 50%. The full amount is due if you pay the fine after 14 days but before 28 days. The time limit may increase to 21 days if they send the PCN to you by postal method (e.g. caught on camera). There are penalties for not paying a PCN within 28 days. You would receive a 'charge certificate' giving you 14 days to pay the original fine plus a penalty of 50% more. Note: Failing to pay a charge certificate within 14 days results in a court order demanding payment. But, parking ticket laws allow you to challenge the ticket if you think it is wrong. 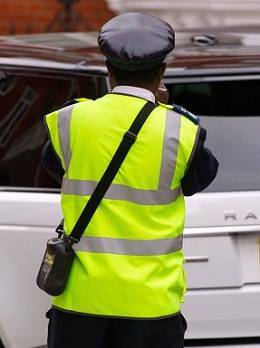 Several different authorities issue Fixed Penalty Notices for illegal parking. They include the police, a local council, and the Driver and Vehicle Standards Agency. There are several ways to make a payment for a Fixed Penalty Notice. The ticket list a few different options. But, in most cases the easiest way to pay the FPN ticket is online. You should pay a fine for a Fixed Penalty Notice (FPN) within 28 days. A request for an appeal hearing in court should also get made within 28 days of receiving an FPN. Otherwise the fine increases by 50%. Paying the fine within 28 days clears you of prosecution and they will not keep your offence on record. Ignoring it usually results in a court summons with possible court costs added on. Note: Certain types of parking FPN can result in penalty points on your licence. An example would be for leaving a vehicle in a dangerous location. Motorists can also get an FPN for some minor motoring offences and resulting from some speeding penalties. Most Excess Charge Notice (ECN) or Standard Charge Notice (SCN) grant you 28 days for payment. Often, they get issued by local councils or by private companies. As a rule, they are the type of parking fines you get on supermarket car parks. But, paying the fine within 14 days sometimes gets a reduction. Check with the ticket issuer for different ways to pay and their payment deadlines. Online payments or phone payments by credit or debit card. Postal payments by cheque or postal order. Personal payments by visiting customer services at your local council office. There are opportunities to challenge a parking fine or a notice if you think the issuance is incorrect. You should contact the ticket issuer if you lose the original ticket. Challenging it within 28 days is making an 'informal challenge'. A rejected PCN appeal made within 14 days often results in an extension of the 50% penalty reduction charge. Different parking ticket rules apply to different types of PCN. PCN issued by local council on the spot (e.g. on your car windscreen): Make an informal challenge with the council. You get a 'notice to owner' which explains how to pay it or make a formal challenge. PCN issued by local council through the post (i.e. a 'notice to owner'): You have 28 days to make a formal challenge or 'representation' after you get a notice to owner. PCN issued by Dart Charge: Make a representation with Dart Charge. Red route PCN: Make a representation with Transport for London (pay TfL Penalty Charge Notice). Congestion charge PCN: Make a representation with TfL. Low emission zone PCN: Make a representation with TfL. Note: If they turn down your formal challenge will send you a 'Notice of Rejection'. You have 28 days to pay or make an appeal to an independent tribunal. If you want to challenge a Fixed Penalty Notice (FPN) you will need go to a magistrates' court. The procedure for doing this is on the back of the parking ticket. The court will send you a summons with the date for your court hearing. Appeal to your local ticket issuing council or online to challenge an Excess or Standard Charge Notice. They will explain how to make an appeal and what happens if the challenge gets rejected. The ticket usually gives details for challenging a parking fine by a private company. You can also contact the ticket issuer to find out how to make a challenge. You can appeal to POPLA 'Parking on Private Land Appeals' if your appeal gets rejected. Blue Badge Scheme: Guidance on application, renewals, and restrictions for disabled parking permits. Highway Code Parking Laws: Roadside stop laws, restrictions, and severe penalties for illegal parkers. Pay TfL PCN: Use this online payment method for paying Transport for London TfL parking tickets.